Totally in unison at the Kop end of Anfield, the home of the celebrated English football club, Liverpool, with a hint of a scouse accent the words of “you’ll never walk alone” ring out week after week; it is that sense of unity that has pervaded over the two days of qualification prior to the start of the Seamaster 2018 ITTF World Tour Platinum Shinhan Korea Open on Thursday 19th July. The sense of togetherness prevails between DPR Korea and the Korea Republic; the crowd has warmed to the unity, in Daejeon they walk together with “hope in the hearts”; could that fact just tip the balance in their favour as the seeded players enter the arena? Germany’s Dimitrij Ovtcharov, the top seed and China’s Xu Xin, the no.3 seed will both be in action, as the top half of the draw in the Men’s Singles event is completed; Dimitrij Ovtcharov plays Frenchman Enzo Angles, Xu Xin opposes Japan’s Masataka Morizono. Contests that promise high quality but note the confrontations involving players from the Korean Peninsula; from DPR Korea, Ham Yu Song, winner of the Under 21 Men’s Singles event, faces Japan’s Kenta Matsudaira, the no.11 seed. Also, from the host nation, likewise, Jeong Sangeun opposes an adversary from the Land of the Rising Sun, he confronts, Koki Niwa, the no.6 seed. Intriguing but is the pick of the contests that involving Jang Woojin? He confronts Germany’s Patrick Franziska, the no.16 seed. Equally, in battle of players with similar styles, the duel between Lee Sangsu, no.5 seed and Portugal’s Tiago Apolonia wets the appetite. Somewhat differently in the Women’s Singles event, the first round will be played to completion. China’s Chen Meng, the top seed, meets colleague, Li Jiayi; compatriots Zhu Yuling, the no.2 seed and Wang Manyu, the no.3 seed, oppose adversaries from Hong Kong. Zhu Yuling meets Li Ching Wan; Wang Manyu opposes Ng Wing Nam. Meanwhile, lower down the order but the most celebrated Chinese names of all, Liu Shiwen, the no.5 seed, plays Li Jie of the Netherlands, Ding Ning, the no.12 seeds confronts Portugal’s Fu Yu. However, for Japan’s Kasumi Ishikawa, a host nation opponent awaits; she meets Lee Nakyung, a player with minimal international experience. A tough task for Lee Nakyung and the same for her colleagues. Jeon Jihee meets Japan’s Minami Ando; Suh Hyowon faces DPR Korea’s Kim Sol Song. Interesting duels but it is the engagement that involves the latter’s colleague Kim Song I, bronze medallist at the Rio 2016 Olympic Games that stands out. She meets Sun Yingsha, the no.11 seed and the player who will represent China at the forthcoming Buenos Aires 2018 Youth Olympic Games. Enthralling contests but it is Mixed Doubles that starts the day; the Korean Peninsula totally involved and with tough tasks ahead. 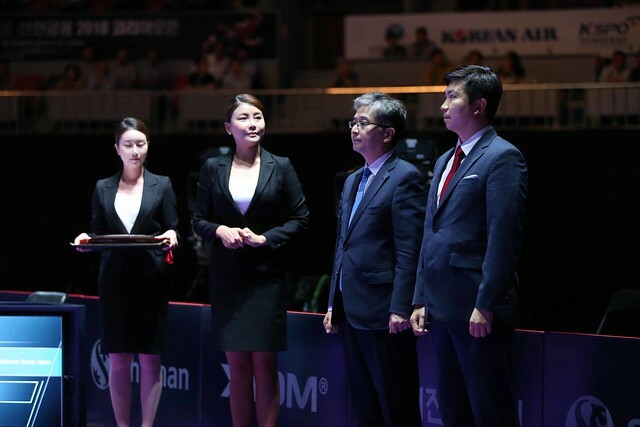 DPR Korea’s Pak Sin Hyok and Kim Nam Hae face Japan’s Masataka Morizono and Mima Ito, the top seeds; the combination of Korea Republic’s Jang Woojin and DPR Korea’s Cha Hyo Sim play Hong Kong’s Wong Chun Ting and Doo Hoi Kem, the no.2 seeds. Similarly, for one further Korean unified team, there is Peninsula encounter ahead; Choe Il and Yoo Eunchong meet Korea Republic’s Lee Sangsu and Jeon Jihee, the no.3 seeds. Likewise in the opening round of the Women’s Doubles event there are tough opponents for the united Korean pairing of Kim Song I and Suh Hyowon, they meet China’s Wang Manyu and Zhu Yuling the no.3 seeds. A daunting task, it is the same for DPR Korea’s Cha Hyo Sim and Kim Nam Hae; they are scheduled to meet Japan’s Hina Hayata and Mima Ito, the top seeds. Currently there is some doubt as to the fitness of Hina Hayata. Occupying the no.2 seeded position in the draw, Korea Republic’s Jeon Jihee and Yang Haeun, start their quest for honours against Singapore’s Lin Ye and Zeng Jian. Testing times ahead and understanding needed quickly, it is the same in the Men’s Doubles competition; Lee Sangsu and Pak Sin Hyok face the combination of Germany’s Patrick Baum and Slovakia’s Thomas Keinath. Listed in the top seeded position, Hong Kong’s Ho Kwan Kit and Wong Chun Ting play Singapore’s Gao Ning and Ethan Poh Shao Feng; Japan’s Masataka Morizono and Yuya Oshima, the no.2 seeds, confront a most dangerous combination in the guise of China’s Wang Chuqin and Xue Fei. Play commences at 10.00am (local time).